Have you ever wondered how your neighbors yard looks so great, has so few weeds and just looks overall better than yours? Chances are that your neighbor knows the importance of pre-spring yard prep, or pays a professional to take care of that for him. Now is the time to lay the groundwork for a healthy yard during the warmer months. Don’t wait until Summer is here to attempt to whip your yard into shape. Give your yard a leg-up this year by following these landscape tips for spring in the months of March and early April: Pruning: Now is the time to prune back all those ornamental grasses to the ground. Summer flowering trees and bushes can be thinned out if you see a lot of overcrowding. Broad-leaf evergreens will benefit from a good trimming of dead branches caused by winter damage. Edging: Edge your planter beds, creating a defined space for mulch to be contained throughout the growing season. Mulching: A fresh coat of mulch on the beds to help prevent weed growth and retain moisture in the beds during the dryer months. Weed Control: Apply a pre-emergent to prevent weeds from coming up through the new mulch and blemishing your beds. Fertilizing: A well balanced fertilizer will help plants off to a good start this growing season. Turf Management: Like plants, grass needs to be nourished as well. The type of applications you should use will depend on the type of grass you have and the region you are in. Hardscape Care: Walkways, patios, driveways, decks, pool decks and any other hard surfaces you may have should be blown off and washed down to remove the winter grit. Depending on the type of hardscape material you have installed, you may want to look into resealing for continued protection. These are just the basics of spring landscape clean-up. If the thought of these simple tasks have you reeling, then we suggest you consider hiring a professional Landscape Contractor to assist you with the work. 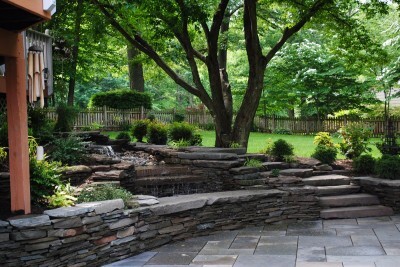 Professional landscape assistance is very beneficial, even for homeowners who enjoy working outdoors. Most companies offer services that are tailored to the individual homeowner’s lifestyle. That means you can choose your ‘least favorite’ or more labor intensive jobs for the pros and keep the more enjoyable tasks for yourself and your family!